As a professional irrigation contractor with more than twenty five years of experience in the field, Cloudburst is an expert in proper sprinkler system layout, plant water requirements, soil types, electrical and plumbing requirements, back-flow prevention codes, and proper sprinkler system installation procedures. All of our construction managers have more than 10 years experience with our company and with more than 4,000 customers, we are the largest and most reputable irrigation company in the area. Cloudburst will design and install a complete irrigation system custom-tailored for your property from small residential homes to 100 acre commercial sites and sports fields. Cloudburst will design a precise irrigation system and install a digital controller (timer) to ensure the highest performance and efficiency of your system. Our installation team will carefully and professionally install the system in a timely fashion, providing minimum disruption to your existing landscape. In addition, your system is backed by a five year parts and labor warranty, one of the most extensive warranty guarantees in the industry provided you purchase an annual service contract each year. From gardens to custom homes to office buildings, from shopping centers to sports fields, Cloudburst is the leader in design and installation of underground irrigation systems. 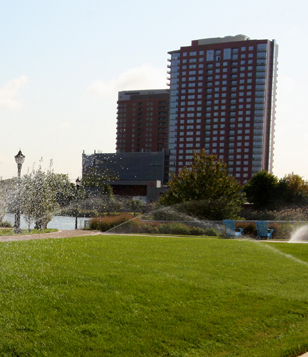 A sprinkler system is a huge asset for any home or commercial property, as it will automatically keep lawns, shrubs and other landscaping properly watered, saving thousands of dollars over the lifetime of a property by avoiding lawn and plant replacements and by providing regular watering regardless of rain or dry conditions. Commercial sites comprise the largest segment of our business. Cloudburst has implemented hundreds of commercial projects in the area from large office complexes to sports fields and 100-acre sites. 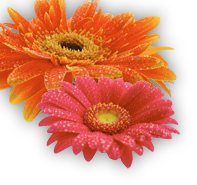 We understand that meeting project deadlines and timing are cruc.ial to a successful project. Cloudburst offers you seamless design build or specified work that is performed within your schedule and your project plan. Cloudburst utilizes sophisticated CAD capabilities to construct a precise system and works with union prevailing wage requirements to make your commercial project come together effortlessly. Regardless of whether work is being done for a general contractor, a community management company or a town municipality, your project schedule, efficiency and proper installation is of our utmost concern. A residential irrigation system will help you maintain a healthy, lush landscape surrounding your home, increasing the value of your property and eliminating considerable time and effort on your part. 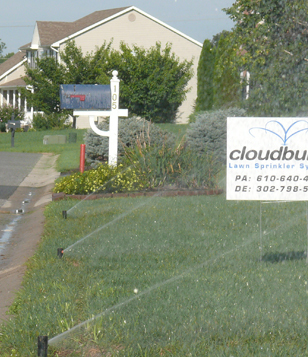 Cloudburst offers its customers a superior lawn sprinkler system that is invisible in a week. Your sprinkler system will be custom designed with a great deal of attention to detail and your unique lawn requirements. To maintain minimal disruption to your lawn and landscaping, beds are hand dug and put back to existing conditions. A vibratory plow, which actually pulls the pipe underground, will be the primary machine used in the installation. The holes for the sprinkler heads will be hand excavated and placed in the appropriate positions. Valves will be assembled and sprinkler heads will be adjusted as to not over spray on unintended areas. Cloudburst has six full construction crews to meet your needs and work with you individually or within your landscaper's schedule. To ensure quality, an experience construction manager is present and on site during the entire installation. All of Cloudburst's construction crews are seasoned professionals, fully insured with more than 10 years experience. After your system is installed we will give you a full demo of the irrigation controller and the rain sensor as well as a thorough quality check after construction process is complete. Cloudburst is committed to 100% customer satisfaction which is achieved by listening to and responding to our customer's needs, utilizing only high quality sprinkler system components and providing timely follow-up and maintenance service to provide a quality irrigation system for your property. Modern sports turf facilities require a distinctly specialized technical approach. 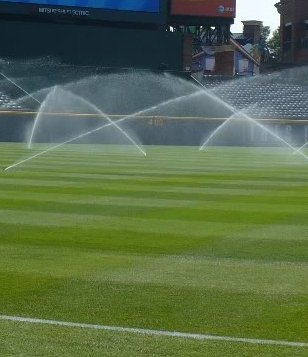 Applying our experience and using its wealth of knowledge to provide solutions for sports fields, Cloudburst provides sophisticated irrigation systems for small sports fields to 100 acre projects. Cloudburst has extensive experience with all types of athletic fields and we carefully evaluate soil type, quality, root depth, and local environment, as well as attention to specific zoning requirements unique to sports field properties taking into account varying watering needs based on field use that can have a profound effect on athletic field irrigation. Cloudburst has invested significantly in both state of the art equipment that is specifically designed for athletic turf facilities, and in the training and development of a highly skilled and experienced workforce. Every site is overseen by one of our sports field construction managers dedicated to the site for the duration of the project.